Note: When installing wheel lock nuts and lug nuts, verify that it is the correct thread size, seating surface type (cone seat, radius seat, shank) and style as recommended by the wheel manufacturer. Minimum thread engagement must be equal to the thread diameter of the wheel stud. Example: M12 x 1.5 nut requires a minimum of 12mm (.472”) of thread engagement. Remove one lug nut from both a front wheel and rear wheel. Visually verify that the seating surface of your lug nut matches the McGard lug nut/lock nut. Install one McGard lug nut or lock nut on both wheels from step one. Tighten to normal installation torque. Remove both McGard lug nuts or lock nuts. 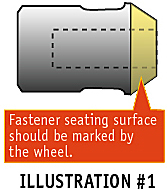 Look at the seating surface of each McGard lug nut or lock nut (see illustration #1). 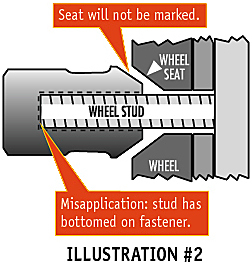 If the seating surface is not marked by the wheel, the lug nut or lock nut may be bottomed on the stud (see illustration #2). Bottomed out refers to the closed end of the nut resting on the stud, while the bottom of the nut fails to fully contact the wheel. Check for space or gaps between wheel and lock or lug nut. This means the McGard set is not the proper one for your vehicle. Note: If your spare tire is on a steel wheel and your road wheels are aluminum, you must also verify the application for your spare tire/wheel. If you do not wish to verify the application now, keep your original lug nuts in your vehicle for use with the spare tire/wheel. Minimum thread engagement must be equal to the thread diameter of the wheel stud. Upon verification of proper application, complete installation per McGard’s installation instructions. Remove one lug nut from both a front wheel and a rear wheel. Visually verify that the McGard lock nut or lug nut shank length matches your lug nut. Verify the McGard lock nut or lug nut shank diameter matches your lug nut. In all lug nut applications, the McGard lug nut must not have a loose or sloppy fit to the wheel hole diameter. Install one McGard lug nut or lock nut on each wheel from step one. Tighten to normal installation torque. Verify the washer is tight on the wheel. Check for space or gaps between wheel, washer and lock/lug nut. 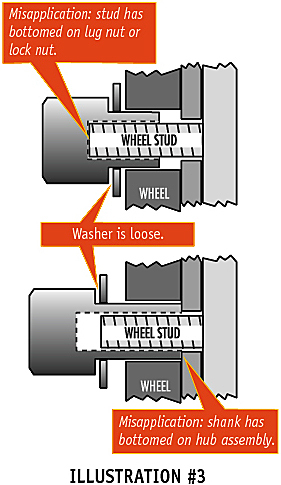 If there are gaps and the washer is loose the lug nut or lock nut may be bottomed on the stud, or the shank has bottomed on the hub assembly (see illustration #3). Bottomed out refers to the closed end of the nut resting on the stud, while the bottom of the nut fails to fully contact the wheel, or the shank is too long and is resting on the hub assembly which will not allow the washer to tighten to the wheel. This means the McGard set is not the proper one for your vehicle. Note: If your spare tire is on a steel wheel and your road wheels are aluminum you must also verify the application for your spare tire/wheel. If you do not wish to verify the application now, or your spare tire/wheel has a different seating surface, keep your original lug nuts in your vehicle for use with the spare tire/wheel. 1. Remove wheel covers (if equipped) and one lug nut from each wheel. Verify that lock style, seating surface style (cone, radius, flat, shank, etc.) and thread size match the lug nut removed. If studs are rusty, clean with a wire brush prior to installing wheel locks. McGard does not recommend the use of oil, grease or anti-seize lubricants on threads. Spraying the threads with a greaseless lubricant (such as LPS-1) once a year is recommended. Be sure to save enough Original Equipment Manufacturer lug nuts for use with the O.E.M. spare tire/wheel. the first fastener removed from the wheel and the last fastener installed onto the wheel. 2. Start wheel locks by hand. Install one McGard wheel lock onto each wheel. Only use one lock per wheel. Verify that minimum thread engagement is equal to the thread diameter of the wheel stud. intain proper pressure to obtain proper installation torque and should not be used for lock installation. Use of impact guns (pneumatic, electric, etc.) for installation may cause over tightening and permanent damage to lock and key tool. Never use an impact gun with a key tool that has a cable or that is attached to another object via a cable or other means. 3. Using the McGard key and a wrench, tighten each lock to the torque specified in your vehicle owner’s manual. For best results, use a torque wrench and socket. Keep the key pattern firmly and squarely engaged into the lock pattern. They can be kept square to each other via direct inward pressure. This will prevent uneven pressure on the key tool which could result in damage to the lock and/or key tool. Over tightening the lock could result in difficulty of removal. 4. Re-torque the locks after 25 miles of driving. WARNING: Eye protection must be used when removing over tightened locks. Use of an impact gun on a key with a cable or key cabled to a lug wrench can cause serious injury. 1. Over tighten all lug nuts on the problem wheel to remove pressure from the lock nut. Do not tighten to the point of stud or lug nut thread damage. n as the repeated ratchet motion will slowly loosen the lock. If the lock is not free after a few minutes, try to remove the lock using a ratchet or breaker bar (making sure to keep direct inward pressure). 3. If the lock does not free itself, loosen one lug nut (4 hole wheels) or two lug nuts (5 hole wheels) opposite the lock and repeat step 2. Note: If the lock still will not come off, call McGard Customer Service Department at 1-800-444-5847 for instructions. 4. Upon removal of the lock, remove all lug nuts and remount the wheel. Install the lock nut per the installation instructions. 1. Remove wheel covers (if equipped) and one lug nut from each wheel. Verify that lug nut thread size, seating surface style (cone, radius, shank) and style match the lug nut removed. If studs are rusty, clean with a wire brush prior to installing. McGard does not recommend the use of oil, grease or anti-seize lubricants on threads. Spraying the threads with a greaseless lubricant (such as LPS-1) once a year is recommended. 2. Replace one fastener at a time. Start lug nuts by hand and snug tight with a wrench. Repeat for each lug nut on the wheel. Minimum thread engagement must be equal to the thread diameter of the wheel stud. d installation torque found in your vehicle owner’s manual. For best results, use a torque wrench and socket for final tightening. Notice: Impact guns usually cannot be set and/or maintain proper pressure to obtain proper installation torque and should not be used for lug nut installation. Use of an impact wrench can result in uneven or over tightening of lug nuts, which could damage studs, wheels or distort brake rotors. 4. Re-torque the lug nuts after 25 miles of driving. 1. SplineDrive lug nuts are for use on aluminum wheels only, not for use on steel wheels. 2. Care must be taken not to dent or scratch SplineDrive lugs with colored caps. 3. When removing the lug nut, do not drop. Carefully place down with aluminum cap facing up. 4. To install SplineDrive Lug Nuts you will need to use the installation tool that came with the lug nuts or was purchased separately. Insert tool carefully and apply inward pressure when tightening and loosening to keep the tool in place. 5. Be sure to save enough Original Equipment Manufacturer lug nuts for use with the O.E.M. steel wheel spare tire. WARNING: Lug Bolts are critical wheel fasteners. Read the following guidelines to ensure that you choose and install the correct lug bolt. Failure to comply with guidelines & warnings could cause an unsafe condition and result in serious injury or death. 1. Remove one lug bolt from both a front wheel and rear wheel. 2. Visually verify that the seating surface of your current fasteners match the McGard fasteners. Verify that the thread size and shank measurement of your current fasteners match the McGard fasteners. Click here for more details. 3. Install one McGard lug or lock bolt on each wheel from step one. Tighten to normal installation torque. 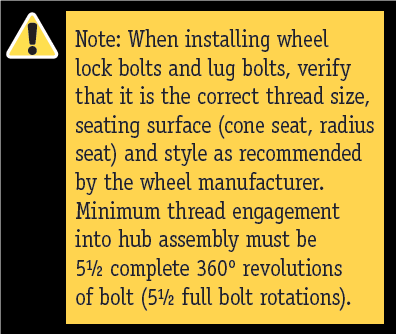 Minimum thread engagement into hub assembly must be 5 1/2 complete 360º revolutions. Too short of a shank will result in lack of engagement and an unsafe condition (see illustration #1). 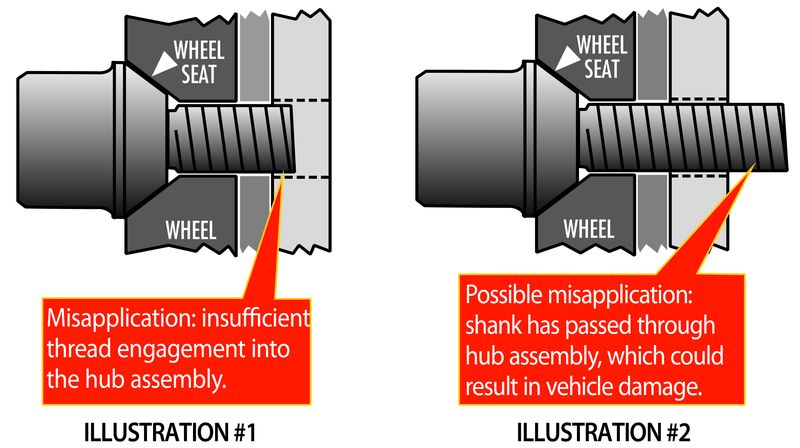 Too long of a shank can extend beyond the hub assembly and possibly cause damage to other vehicle parts (see illustration #2). 4. Upon verification of proper application, complete installation per McGard’s installation instructions. Note: If your spare tire is a steel wheel and your road wheels are aluminum, you must also verify the application for your spare tire/wheel. If you do not wish to verify the application now, you should keep enough of your original fasteners in your vehicle for use with the spare tire/wheel. 1. Remove wheel covers (if equipped) and one lug bolt from each wheel. Verify that lock style, shank length, seating surface style (cone, radius) and thread size match the lug bolt removed. Be sure to save enough Original Equipment lug bolts for use with the O.E.M. spare tire/wheel. Note: When servicing your vehicle, the lock should always be the first fastener removed from the wheel and the last fastener installed onto the wheel. 2. Start wheel locks by hand. Install one McGard wheel lock onto each wheel from step one. Only use one lock per wheel. Verify that the minimum thread engagement into hub assembly is 5½ complete 360º revolutions of the fastener. Some lock bolts are a 2-piece design. Make sure that the floating seat washer is attached to the lock bolt before installation. McGard does not recommend the use of oil, grease or anti-seize lubricants on threads. Notice: Impact guns usually cannot be set and/or maintain proper pressure to obtain proper installation torque and should not be used for lock installation. Use of impact guns (pneumatic, electric, etc.) for installation may cause over tightening and permanent damage to lock and key tool. Never use an impact gun with a key tool that has a cable or that is attached to another object via a cable or other means. 4. Now you must verify that the lock bolt shank has not passed through the hub assembly too far, causing interference with other vehicle parts. Rotate each wheel a minimum of 2 revolutions while checking for clearance and any contact with other vehicle parts. Contact could result in vehicle damage. 5. Re-torque the locks after 25 miles of driving. 1. Over tighten all lug bolts on the problem wheel to remove pressure from the lock bolt. Do not tighten to the point of lug bolt thread or hub assembly damage. 2. Remove the lock with your key tool. When using hand tools such as a lug wrench, ratchet, etc. direct inward pressure on the key tool must be used. This will keep the key pattern firmly and squarely engaged into the lock pattern. Normally McGard does not recommend the use of an impact gun, but if the key tool is not attached to another object (some McGard keys are equipped with a plastic or steel cable) an impact gun does work best for removing over tightened locks. If using an impact gun, the lock may not come free immediately. Continue using the impact gun as the repeated ratchet motion will slowly loosen the lock. If the lock is not free after a few minutes, try to remove the lock using a ratchet or breaker bar (making sure to keep direct inward pressure). 3. If the lock does not free itself, loosen one lug bolt (4 hole wheels) or two lug bolts (5 hole wheels) opposite the lock and repeat step number 2. Note: If the lock still will not come off, call McGard Customer Service Department at 1-800-444-5847 for further instructions. 4. Upon removal of the lock, remove all lug bolts and remount the wheel. Install the lock bolt per the installation instructions. Some lock bolts are a 2-piece design. Make sure that the floating seat washer is attached to the lock bolt before installation. 1. Remove wheel covers (if equipped) and one lug bolt from each wheel. Verify that lug bolt thread size, seating surface style (cone, radius), style and shank length match the lug bolt removed. 2. Replace one fastener at a time. Start lug bolts by hand. Repeat for each lug bolt on the wheel. Minimum thread engagement into hub assembly must be 5½ complete 360º revolutions. Lug bolts are a 2-piece design. Make sure that the floating seat washer is attached to the lug bolt before installation. McGard does not recommend the use of oil, grease or anti-seize lubricants on threads. 3. Tighten lug bolts in a progressive crisscross pattern to the recommended installation torque found in your vehicle owner’s manual. For best results, use a torque wrench and socket for final tightening. Notice: Impact guns usually cannot be set and/or maintain proper pressure to obtain proper installation torque and should not be used for lug bolt installation. Use of an impact wrench can result in uneven or over tightening of lug bolts, which could damage bolt threads, wheels or distort brake rotors. 5. Re-torque the lug bolts after 25 miles of driving. 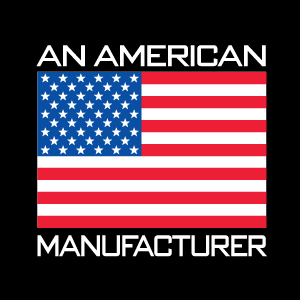 If you have questions, call McGard Customer Service Monday-Friday, 8am-5pm Eastern time, 800-444-5847.